Wed, May 30th 2018 - Brian Travis live at Mare Island Brewing Company in Vallejo. 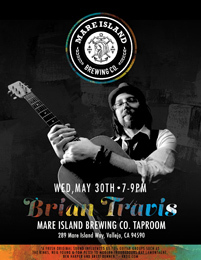 Brian Travis will be performing new material and acoustic versions of BTB favorites along with Matt Gretter and Brianna Musso on Wed May 30th from 7-9pm at Mare Island Brewing Company located on the Vallejo waterfront in the Ferry Building. The Mare Island Brewing company is located at: 289 Mare Island Way, Vallejo, CA 94590. 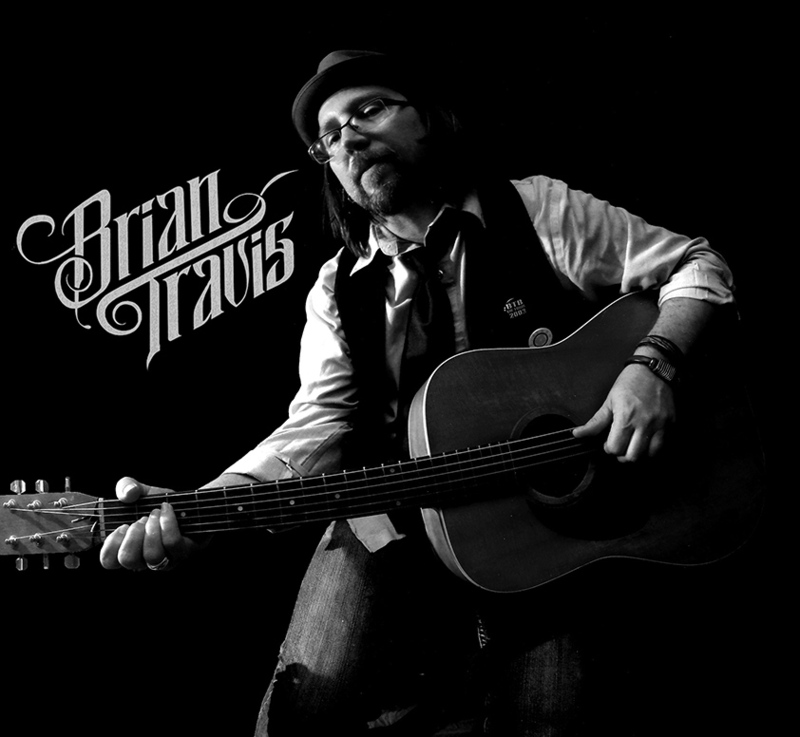 It's been many moons since BT has made a live appearance, so we hope you take the oppertunity to enjoy a night of good food, excellent Mare Island Taproom beers and the original songs of Brian Travis on Wed, May 30th! 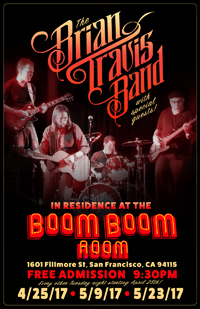 BTB Three Show Residency at The Boom Boom Room in San Francisco! Recently the BTB were contacted by The Boom Boom Room in San Francisco saying that they had caught word that the band has been delivering long nights of reckless, dance-inducing, original rock 'n roll all over the Bay Area. They said the BTB were one of their first choices when considering acts to play a series of residency shows at their club! 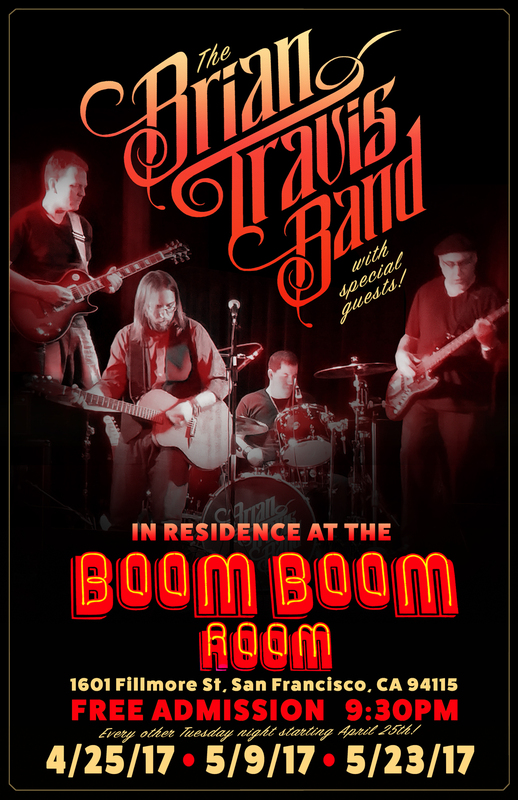 For all of you SF dwelling music lovers who have been asking us to play in the City: The Brian Travis Band are now booked for THREE shows at The Boom Boom Room. Tues, April 25th, Tues, May 9th and Tues May 23rd. Start time is 9:30pm. Free admission, so bring your friends or meet them there! Special guests will be featured at all three shows and as of now, The very excellent Patrick Ford Band are confirmed as the special guest for the third Residency show on May 23rd. Other special guests are TBA, so keep checking back for updates! We're looking forward to performing regularly in SF, so please show your support and show up for us at The Boom Boom Room on Tuesday nights in late April and May 2017! The BTB return to Peri's in Fairfax! The BTB have been asked back to Peri's for 2 hours of unadulterated rock 'n roll. If you've been feeling like you need a reprieve from executive orders, fake news and alternative facts, or if you just need a night out to blow off some steam and dance, the BTB are here to help! The show is FREE and Peri's Bar is located in downtown Fairfax, just a few doors down from the big movie theater. 29 BROADWAY FAIRFAX CA 94930. For your convenience there is a private parking lot for patrons. We are looking forward to a night of melody, guitars and reckless abandon! We hope you'll join us at 9pm on Thursday, March 16th! 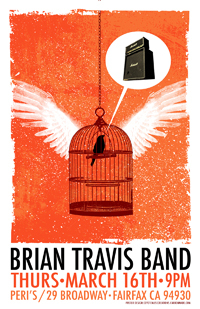 The Brian Travis Band live at Hopmonk Tavern in Novato! The BTB will be performing on Saturday, Feb 25th at Hopmonk Tavern in Novato with Jethro Jeremiah Band opening. It's our first time at Hopmonk Tavern, so please come out and help us pack the place! We are looking forward to a great night of live music. The Jethro Jeremiah Band is a Reggae/Soul outfit with emphasis on the lyrical message, melodies and harmonies. They also know how to drop a nice beat for folks to move to. The band consists of Jethro Jeremiah on rhythim guitar and lead vocals, Noelle Glory on backing harmonies, Steven Munger on Sax, Dan Stillwell on drums, Toads Marcelino on bass guitar. Advance tickets are available now! Go HERE to secure your ticket in advance. Doors open at 8pm and the show starts at 9pm. Full Sweetwater live video on BTB Youtube Channel. Christmas is coming early for BTB fans! Our Christmas present to YOU is a video of a full 42 minute BTB concert taken from our recent Sweetwater show on November 27th 2016. The show was shot and edited together by Brian Travis and will is now available on The Brian Travis Band YOUTUBE channel. Tracklist includes: Ukulele, Tidal Wave, Bridges, Siren, I Need To Know, The State I'm In, Burn and our cover of Ray Wylie Hubbard's epic track, Snake Farm. This is over 42 minutes of the BTB live in a great venue in Northern California. 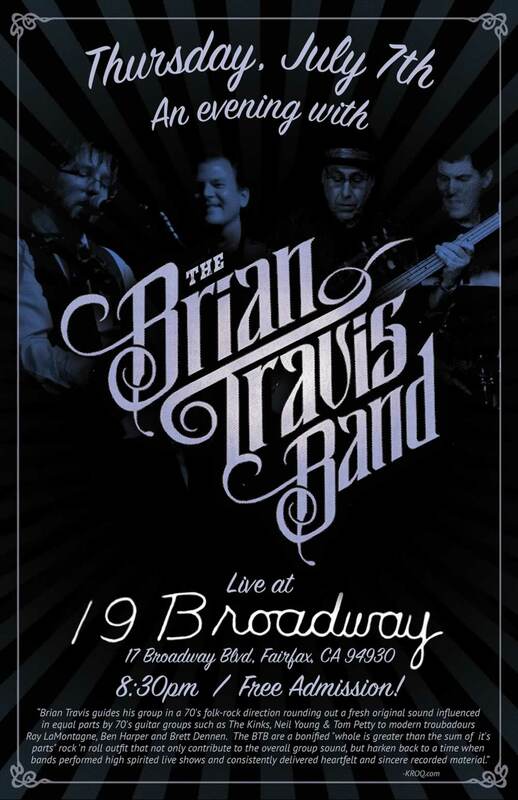 Enjoy the concert footage and please don't forget to subscribe to The Brian Travis Band youtube channel! Awaken The Warrior Inside You. The Brian Travis Band, like ther rest of the nation, are well aware of the conflict between the Standing Rock Sioux and other warriors who are protesting the Dakota Pipeline. Law enforcement are currently assaulting the tribes who are trying to protect our water by spraying them with high pressure water hoses (oh the irony!) and shooting rubber bullets at protestors. Defeating the Dakota pipeline is a fight worth fighting. If you cannot be there, donate what you can to those who are there. Also, if you bank at Wells Fargo (a bank known to be funding the Dakota Pipeline construction) pull your money out and put it in a credit union. Action is required now. Awaken the warrior inside of you. If you are equally outraged, here are some phone numbers. We urge you to call immediately and often! BTB support Tinsley Ellis at Sweetwater Nov 27th 2016! 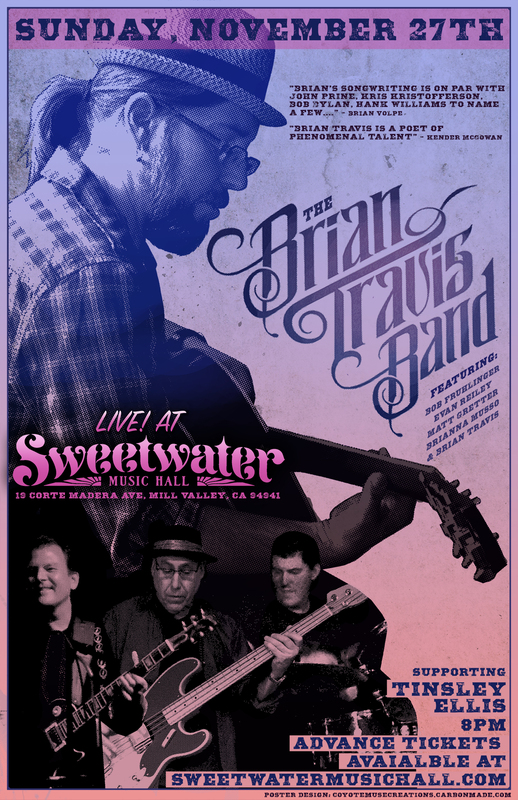 The Brian Travis Band are excited to announce that they are performing on Sunday, November 27th at Sweetwater Music Hall, a state-of-the-art nightclub in Mill Valley, CA that presents nationally recognized entertainment as well as local and emerging talent. Tinsley Ellis, who has toured the globe and released 19 albums, will headline the show with The Brian Travis Band in the support slot. Ellis has hit the heights of commercial success with songs covered by other artists – notably, Jonny Lang recording "A Quitter Never Wins." He won Rock/Blues Album Of The Year with Tough Love in 2015 from Blues Blast Magazine. Get your advance tickets TODAY and don't miss the BTB at a world class venue supporting Tinsley Ellis! 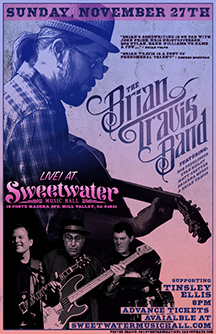 Sweetwater Music Hall is located at 19 Corte Madera Ave, Mill Valley, CA 94941. Upcoming San Francisco show at Hotel Utah! 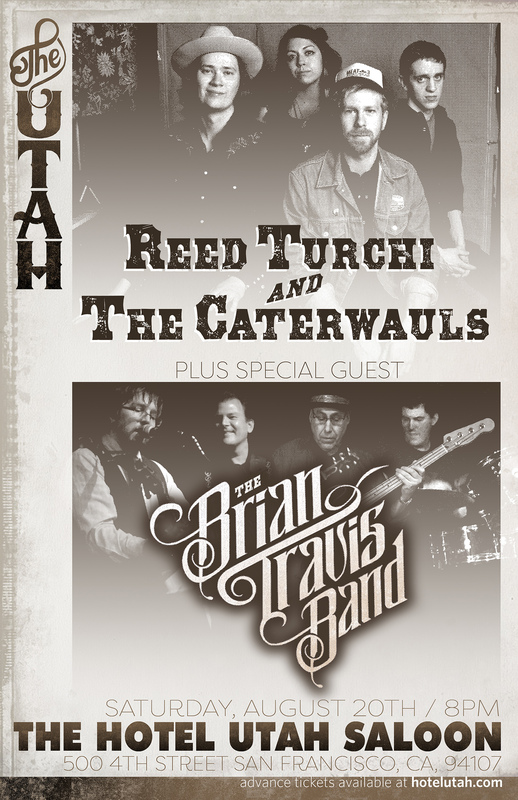 The Brian Travis Band return to Hotel Utah on Saturday, August 20th to perform a 45 minute set opening for Memphis blues rockers Reed Turchi and the Caterwauls. The show begins at 8:30pm and also features Jerry Castle, a songwriter who hails from the small Appalachian town of Abingdon, VA and SF locals, Overbite. 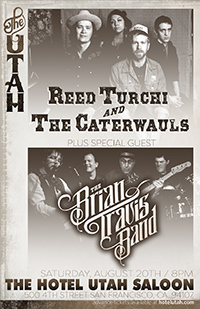 The Brian Travis Band take the stage at 10:15pm and admission is $10 in advance and $12 at the door. You can secure advance tickets for this show HERE. Saturday August 20th is going to be a rocking night of music in San Francisco! We are looking forward to sharing the bill with the other great acts and sharing our original blend of California Americana Rock 'n Roll with you all at Hotel Utah! 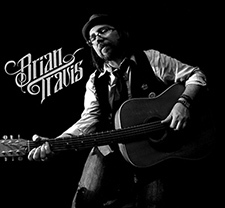 Brian Travis performs Solo Acoustic in Vallejo. Brian Travis has been asked to perform a 45 minute solo acoustic set at The Hub in Vallejo as part of Julian Phillips TwoFish Guitar Showcase on Sunday, July 24th. The show begins at 6:30pm and will feature a smattering of North Bay acoustic artists. There will be a cover charge/donation at the door and a tip jar which will give you the opportunity to support local live music in Vallejo. The Hub is located at 350 Georgia Street Vallejo, CA 94590 and is a place for people to connect, share knowledge, show artwork, build community, and create activity, interest, vibrancy & prosperity in Vallejo. 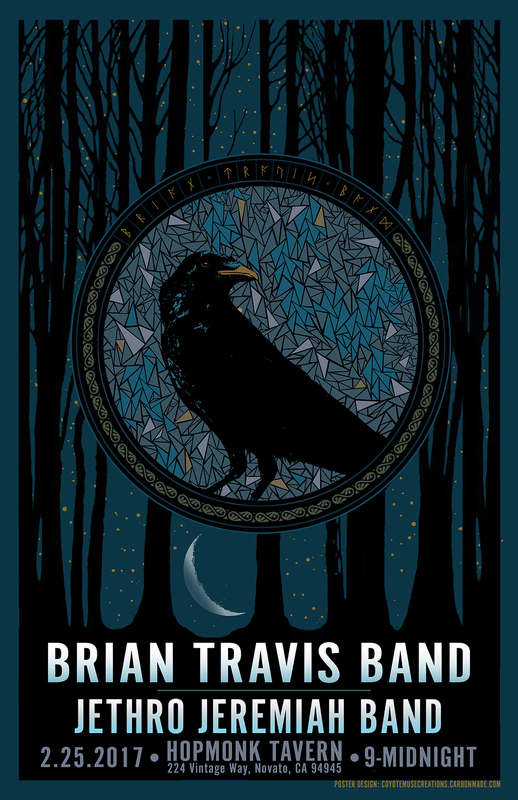 The Brian Travis Band Return to Fairfax! It's summertime and the living is easy! Cold beers, cocktails, dancing and live music in the quaint and beautiful Marin town of Fairfax. 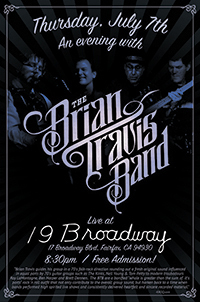 Join The Brian Travis Band as we return to 19 Broadway for another full night of rock 'n roll in the middle of summer! Two sets of music starting at 8:30pm. Bring friends, dance, and be part of the growing bay area music scene. 19 Broadway Bar & Night Club is one of the premier music venues, bars and nightclubs in the Bay Area. Located in the town of Fairfax in Marin County, just a 14 mile drive north of San Francisco. 19 Broadway is known by both musicians and fans as a major destination for live music. 19 Broadway offers a wide spectrum of musical genres from dance-hall and roots to blues, funk, rock, soul, Americana and jazz, and a diverse range of international, regional and local artists. May 2016 Mirth & Mayhem Mini-Tour! 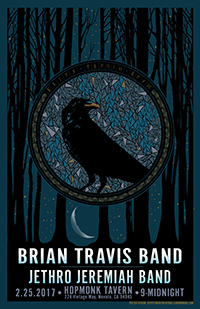 The Brian Travis Band are celebrating the warm spring weather by performing two back to back shows in May 2016, dubbed the Mirth & Mayhem Mini-Tour the band will be at 19 Broadway in Fairfax CA on Thursday, May 12th and Smileys Saloon in Bolinas CA on Friday May 13th. The band will be giving away 2 BTB CD's to all fans who attend BOTH North Bay shows! We are looking forward to see you at the show(s)! 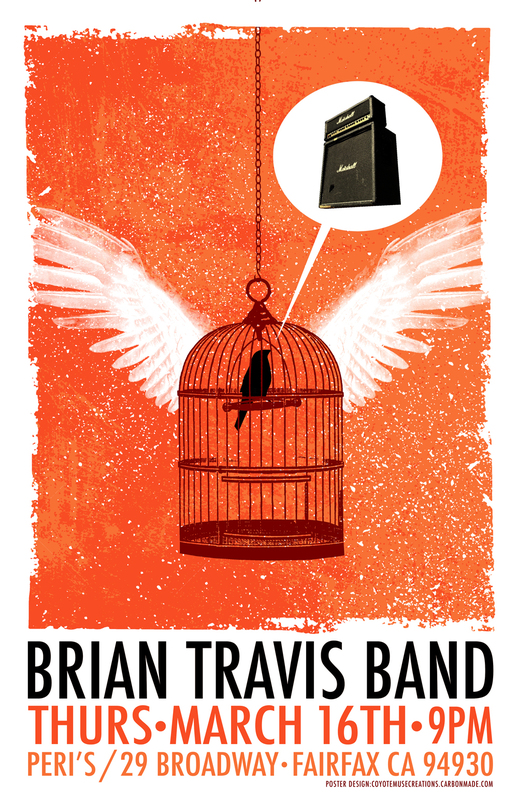 The Brian Travis Band return to LA: One Night Only! The Brian Travis Band are making a rare Los Angeles appearance at Vendome Wine & Spirits on Tuesday, April 12th in Toluca Lake. We hope to share a wonderful evening of BTB music with our friends, family and fans! The music starts at 6pm and goes until 9pm. This is the first full band appearance in Los Angeles in 2 years! Vendome offers fine wine, spirits, & beer from around the world! Enjoy the wine tasting and the live music from The Brian Travis Band! We are pleased to announce the release of the brand new Brian Travis Band music video for the song "Taney County Town". The music video was shot during BT's solo tour of the midwest and chronicles his time in The Ozarks where he grew up. The video has been posted to youtube and has already been getting a fair amount of views reaching over 1,500 in the first 48 hours! Enjoy the new video and feel free to share it on social media to keep the view numbers climbing! Please SUBSCRIBE to The Brian Travis Band youtube channel HERE! 2016 Brian Travis LIVE AT THE EMPRESS THEATRE! 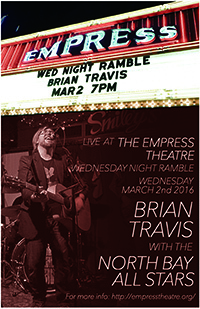 On Wed, March 2nd Brian Travis will appear as a featured songwriter at The Empress Theatre as part of their Wed night Ramble series. Brian Travis will perform 8 of his best songs (and perhaps a few cover songs, you really never know what will happen...) with The North Bay All Stars (featuring Don Bassey, Mike Emerson, Kevin Fraizer, T Moran, and Matthew Silva) backing him up! The Empress Theatre is a historical landmark located in downtown Vallejo, California built in 1911. It was re-opened in 2008 after nearly 20 years of disuse following the 1989 Loma Prieta earthquake. The one room movie house has undergone complete renovation and seismic retrofit featuring a state of the art sound system, velvet seats, dance floor & full bar. The news that legendary artist and music innovator David Bowie passed away on Jan 10th 2016 was a shock to the world and his passing has left a creative void in the universe that has been felt by all who adored his talent, uncompromising creative vision and prolific creative output. As a way to cope with the loss Brian has recorded an acoustic tribute version of Bowie's song "Five Years" and posted it to youtube. Soon after the organizer of "LIFE ON MARS: An East Bay tribute to the Art and Music of David Bowie" contacted BT to perform the tribute song live on Sat, Feb 13th at The Marsh Cabaret Bar as part of the Bowie tribute show in Berkeley. BT will be joined by Matt Gretter on drums for this one off performance. BUY THE NEW BTB ALBUM "THE COYOTE & THE CROW"